Person to person loans, known also as P2P loans, don’t come from traditional lenders like banks, credit unions, and finance companies. Instead, you're borrowing money from another person, or multiple people. You'll pay interest on your loan, but may have an easier time getting approved for one of these over a traditional bank loan. P2P loans have changed the world of lending. In the broadest sense, a P2P loan can happen between any two people, including loans from friends and family. Any two people can set up a loan and repayment arrangement that is mutually beneficial, preferably with a written agreement. That said, P2P lending usually refers to an online service that handles all of the logistics for both borrowers and lenders. In addition to providing agreements, payment processing, and borrower evaluation, P2P lending makes it easier for people to connect. Instead of borrowing only from people you know or those in your community, you can access each company's website and sign up to borrow from individuals and organizations nationwide. Numerous websites have made P2P loans widely available. Prosper.com was one of the pioneers, but there are plenty of others, and new lenders appear regularly. Why Use Person to Person Loans? You might wonder why you’d try a P2P lender instead of a traditional bank or credit union. P2P loans can help with two of the biggest challenges borrowers face: cost and approval. Lower costs: P2P loans are often less expensive than loans available from traditional lenders, including some online lenders. Applying for a loan is typically free, and origination fees tend to be roughly five percent or less on most loans. Perhaps most importantly, those loans often have lower interest rates than credit cards. The most popular lenders offer fixed interest rates so that you have a predictable, level monthly payment. 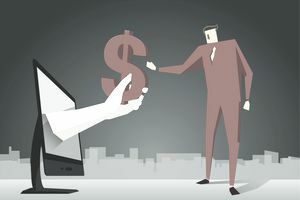 P2P lenders don’t have the same overhead costs as the largest banks with extensive branch networks, so they pass some of those savings on to borrowers. Easier approval: Some lenders only want to work with people who have good credit and the best debt-to-income ratios. But P2P lenders are often more willing to work with borrowers who’ve had problems in the past or who are in the process of building credit for the first time in their lives. With good credit and a strong income, loans are less expensive, and that’s also true with P2P lenders as well as traditional lenders. But in many communities, lenders who are interested in working with low-income borrowers or people with bad credit tend to charge substantially higher rates and fees. Those borrowers then have just a few options, like payday loans similar products. A few P2P lenders, such as Net Credit, offer loans for people with credit scores as low as 520. Other P2P lenders that make loans to people with a less-than-optimal credit score can charge up to 36 percent interest, but this still beats a payday loan. P2P loans are often, but not always, unsecured personal loans, so you do not need to pledge any type of collateral to get approved. Each P2P lender is different, but the idea is that there are lots of people out there with money to lend, and they’re looking for borrowers. Qualifying: To borrow, you generally need decent, but not perfect, credit. Again, different services have different requirements, and lenders can also set limits on how much risk they’re willing to take. At most big P2P lenders, several risk categories are available for investors to choose from. If you have high credit scores and income, you’ll fall into the lower-risk categories. Some lenders look at “alternative” information such as your education and work history, which can be handy if you have a limited credit history. Applying: With most lenders, you just fill out an application that’s similar to any other loan application. In some cases, you’ll provide a personal narrative or otherwise tell lenders about yourself and your plans for the money. You might even be able to use social networks to help you get approved. Once your application is accepted, funding might be more or less instant, or it could take a few days for investors to decide to fund your loan. Costs: You’ll pay interest on any loan you get, and your interest costs are baked into your monthly payment (those costs generally aren’t billed separately). In addition, you’ll likely pay an origination fee of several percent of your loan amount, although the better your risk profile, the lower the fee. Be sure to factor in that cost as you set your loan amount, because it may reduce the amount of cash you end up getting. Additional fees may be charged for things like late payments, returned checks, and other irregular transactions. Repayment: If your loan is approved, you’ll generally repay over a period of three to five years, but you can usually prepay without any penalty. Payments come out of your checking account automatically unless you set up something different, so the process is effortless. Credit reporting: The most popular online P2P lenders report your activity to credit bureaus. As a result, your on-time payments will help you build and improve your credit, making it easier to borrow on better terms in the future. However, if payments fail to go through or you default on the loan, your credit will suffer. Make those payments a priority and communicate with your lender if you fall on hard times. Lenders: There are several P2P lenders to choose from, and more open up shop every year. Two of the oldest lending networks include Prosper.com and Lending Club, and you can try for personal and business loans from those lenders. Upstart is a growing competitor for personal loans, and Funding Circle is a growing business lender. The original P2P lenders funded your loan from other individuals. Now, the space is evolving, and financial institutions increasingly fund loans, whether directly or indirectly, instead of individuals. If that matters to you (you might not care – as long as you’re getting a loan from somebody), research the service you’re thinking of using and find out where funding comes from. Person to person loans aren’t limited to established online sites. You can set up loans informally or use crowdfunding methods instead of going through mainstream sites. To avoid any problems, discuss your plans with a local attorney and tax advisor. You may need to use a written agreement and follow certain rules to get the results you want. Local professionals are able to help, and several online services provide customized agreements.